Welcome to another Home Flooring Pros flooring review. Today we’ll be reviewing Mannington Adura flooring (and Adura Max flooring). Look out for a future review of Mannington Resilient and Luxury Sheet Vinyl products. We’re going to look closely at the differences between Adura and Adura Max and the different collections available (as well as some of the advantages and disadvantages of this type of flooring). To give you a very quick overview: both Adura and Adura Max are durable luxury vinyl floors, tougher than standard vinyl, and Adura Max offers even further protection for busy households with extra quiet floor and water resistance qualities. There’s not a lot of difference between Adura and Adura Max in terms of price, they both retail between $3.50 and $4.20 per square foot, so it’s all about choosing the best product for your home. 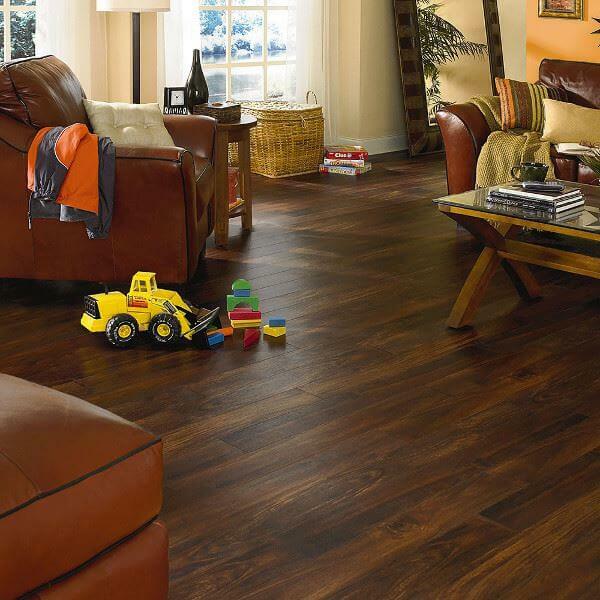 Adura flooring is available from many local flooring outlets and you can buy online from Wayfair.com. One way that they do this is by offering a comprehensive range of good quality flooring products. 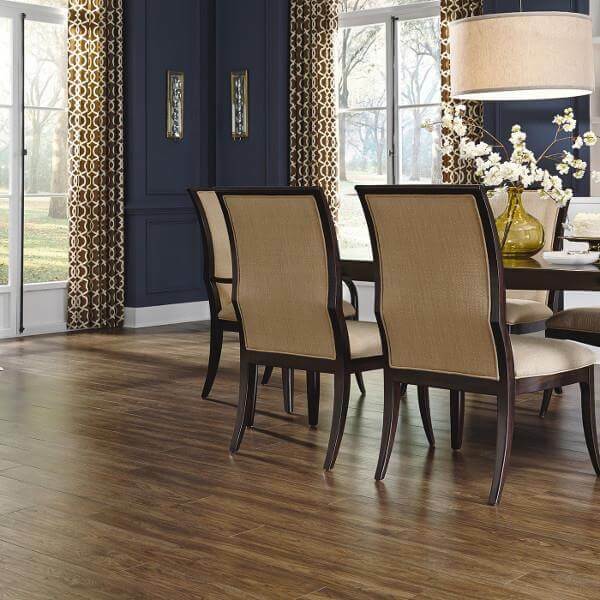 Today Mannington Mills Inc. stay ahead of the competition by producing resilient sheet vinyl, luxury vinyl, laminate and hardwood floors, carpet and rubber via their multiple brands including Mannington Residential, Mannington Commercial, Amtico and Burke. But as you know, we’ll be looking more closely at the Mannington Residential luxury vinyl flooring, with their two ranges Adura and Adura Max. Before we go into detail about the different collections within each range, let’s look at the basic technicalities so you can understand the differences between Adura and Adura Max. 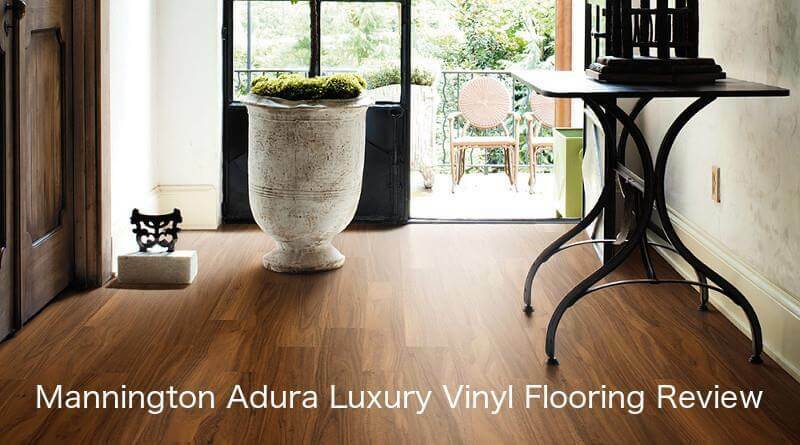 Adura is available in either wood look luxury vinyl tile or stone look luxury vinyl plank collections. Several different sizes available depending on the collection – 16” x 16”, 5” x 48”, 6” x 48”, 12” x 24” and 4” x 36”. ScratchResist™ technology included – their patented performance coating with aluminum oxide to maximize longevity of their flooring. FloorScore certified for optimum indoor air quality performance. 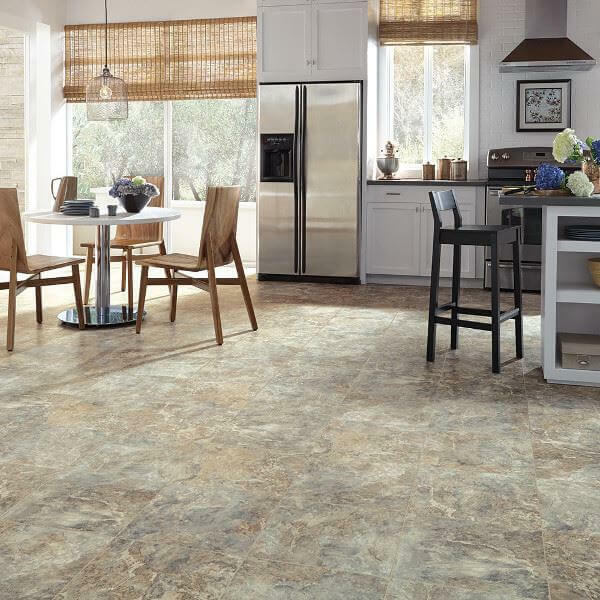 Installation either by glue down method or floating floor method with Mannington’s LockSolid click & lock system; installation method dependent on the collection. Certain collections can also be installed with grout (note that Mannington have their own grout designed to coordinate with Adura collection LVT colors). Various matching moldings are also available, for stairs, floor transitions etc. Limited lifetime residential/ 6 year light commercial warranty. Available in mainly in wood look luxury vinyl plank; with smaller stone look luxury vinyl tile collection. Several different sizes available depending on the collection – 6” x 48”, 12” x 24” and 7” x 48”. HydroLoc™ waterproof core included – making Adura Max suitable for most rooms in your home. Ultra-Quiet™ attached pad for superior sound reduction and greater comfort underfoot. Installation only with floating floor method via Mannington’s LockSolid click & lock system. No option for groutable LVT. Limited lifetime residential/ 10 year light commercial warranty for Adura Max; 20 year limited residential/ 6 year light commercial warranty for Adura Max Prime collection. Whether or not you opt for Adura or Adura Max will in part be dictated by your flooring project location and design style. With its upgraded waterproof core, Adura Max is certainly the better choice for kitchen, bathroom and basement installations – it also makes it more forgiving when installed over less than perfect subfloors. Meanwhile, the Adura collection has a larger selection of stone look LVT, great if you’re looking for the marble or limestone look with a more affordable price tag than the real deal. Both ranges have the inherent advantages of luxury vinyl flooring of being easy to maintain – regular sweeping or vacuuming and occasional mopping should suffice – and being comfortable underfoot. It is also worth noting that Mannington Adura LVT is a decent budget option. You can expect to pay between $3 to $4.50 per square foot, compared to other LVT brands which can be as much as $7 per square foot. Mannington Adura and Adura Max also compare very favorably to mid-range hardwood and natural stone flooring which can costs upwards of $5 per square foot. Variety of sizes and styles to suit most residential projects. The main reason you would want to avoid Mannington Adura and Adura Max LVT is that they are always going to only ever be an imitation of the real thing. If you are restoring a period property, and want to commit to authentic detail, then luxury vinyl flooring is not an option worthy of consideration. Also, as with all LVT and LVP, poor installation can cause problems over time; Mannington is not alone in rejecting compensation claims for poorly functioning flooring where the initial cause is inadequate subfloor preparation or slapdash installation. Whilst Adura and Adura Max are reasonably easy to install, we would always recommend using a professional who has experience of using this brand to ensure best results. Mannington provide detailed advice about installation on their website. Never going to have the exact same feel/ look as authentic hardwood or stone. Can perform badly over time if badly installed. So let’s now look at the different collections in the Adura and Adura Max ranges. 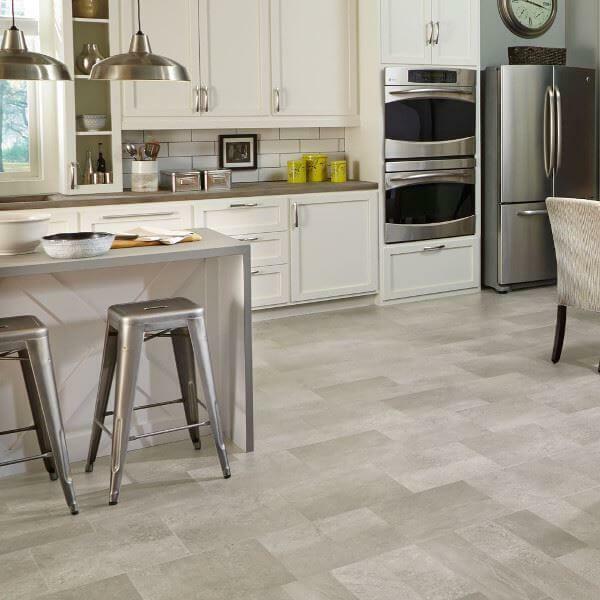 In fact, Mannington don’t always refer to the different styles of their luxury vinyl as defined collections; rather they have a particular design – either stone look or wood look – which then comes in one or more different colors. So to make things easier here, we’ll look at the different styles in rather broad strokes. 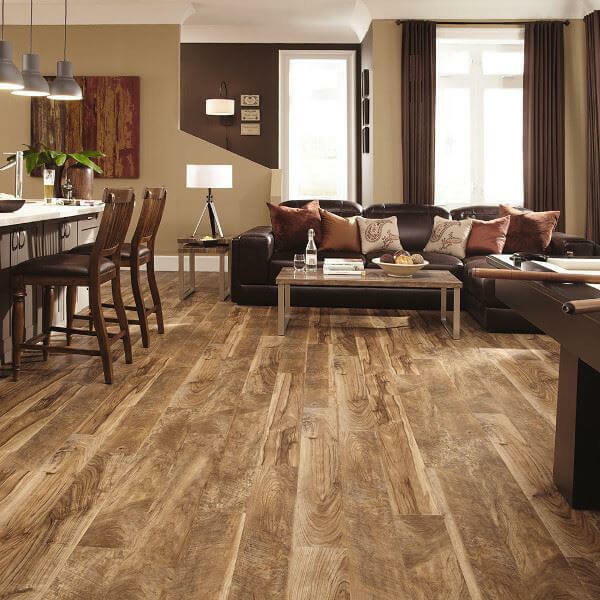 Let’s start our Mannington Adura reviews with a look at their different luxury vinyl tile and plank collections. The majority of the stone look tiles in the Adura range are available in two sizes, 12” x 24” and 16” x 16”. 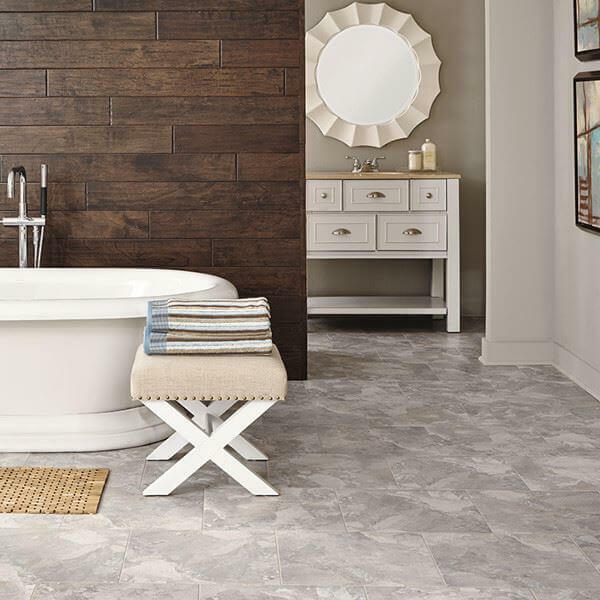 The rectangular size is available as both glue-down or floating floor with Mannington’s LockSolid tile system; the glue down versions can be installed with grout. There are currently 15 different stone look designs available, including the rather beautiful marble aggregate style of Corinthia (pictured above) and the rugged slate tones of the Rushmore design (pictured below). This standard collection of Adura wood look LVT only has 5 different designs, offering a small but perfectly considered group of styles that mimic popular hardwoods such as oak, maple and teak. Our favorite is the Country Oak design (pictured below) available in 3 colors, which features rustic accents for extra character. All of these Adura luxury planks are available in the 4” x 36” size, in both glue down and floating floor installation options. If you’re looking for more choice and design detail, the Adura Distinctive Plank collections offer 13 different designs, with a wide range of both domestic and exotic hardwood styles. All of the options here have great character such as such as the dramatic, deep, treacle-like tones of the Acacia design; the light and airy whitewashed Avalon design; the distressed and weathered style of the Dockside design, complete with saw marks and knotholes; or the finely grained Tribeca design (pictured below), an oak style flooring in 6 colors including on-trend gray. The Adura Distinctive Plank designs are available in 5” x 48”, 6” x 48”, glue down or floating floor depending on the design. There are currently 10 designs in the wood look Adura Max plank range; note that five of these designs (Acacia, Dockside, Sundance, Margate Oak and Meridian) are also available in the Adura range. 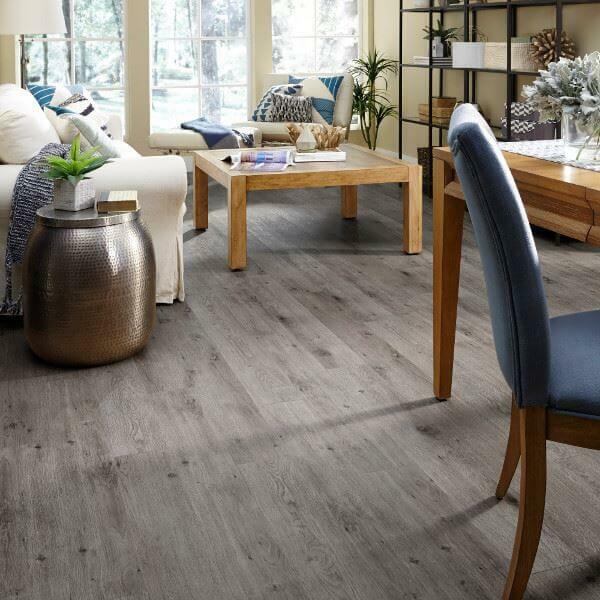 The difference here is in the LVT construction, with the added HydroLoc™ waterproof core in the Adura Max range making these particular planks a better choice for rooms prone to humidity. Available only in floating floor installation style; sized 6” x 48” or 7” x 48” depending on the design. The ten different designs give a good breadth of style options, from classic hickory in the Sundance design (picture below), to the salt-worn, beach weathered planks of the Seaport design. The Adura Max Prime range is another wood look luxury vinyl tile offering 7 designs, some of which are found in the standard Adura range, but in larger format (at 7” x 48”) and featuring the HydroLoc™ waterproof core. 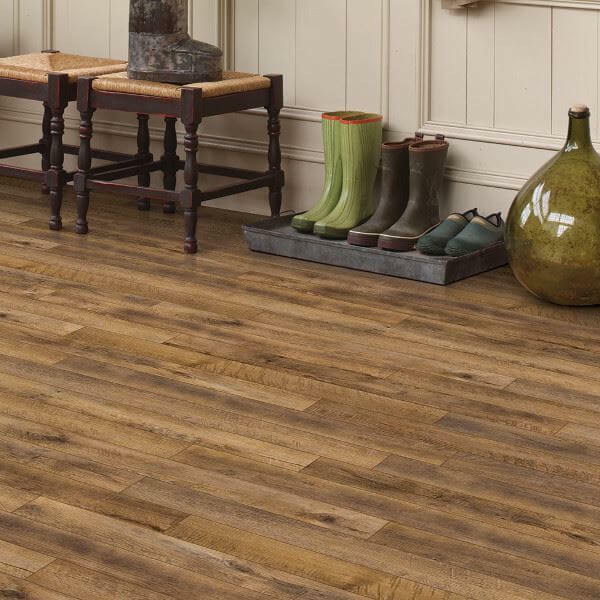 We particularly like the Heritage design (pictured below) in this size, as the wider plank size gives the already beautiful, rustic maple design added authenticity and does justice to the detailed graining. Just 4 stone look designs are currently available in the Adura Max Rectangles range; all available in 12” x 24” floating floor installation. As mentioned before the HydroLoc™ waterproof core makes these tiles a good choice for bathrooms; however, the lack of design choice is rather limiting. 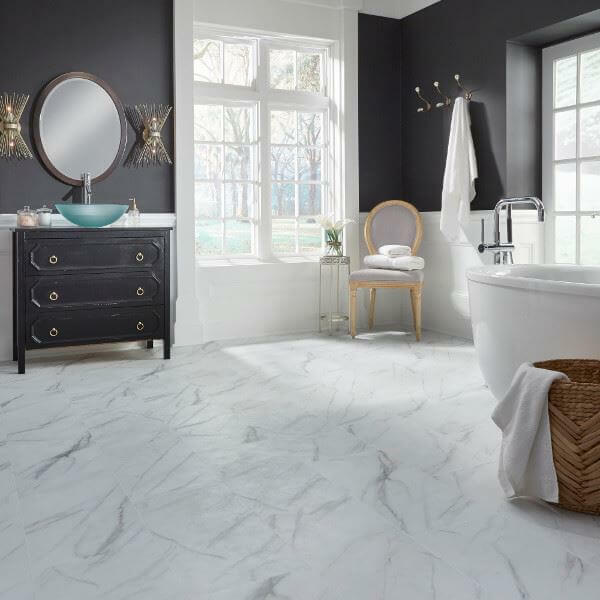 Pictured below is the Legacy design which is based on Carrera marble – it’s not as delicately veined as the real thing, but in a small bathroom it could do a great job fooling the untrained eye! Finally, there is one new design recently added to Mannington’s product range – the Meridian design – that is available across all the formats, both Adura and Adura Max. The design doesn’t really fit into any of the ranges above, as its look is based on weathered concrete – a very urban, on-trend design, perfect for slick, contemporary spaces. The Meridian design (pictured below) is available in several different plank and rectangular sizes – 16” x 16”, 6” x 18”, 12” x 24” and 6” x 48” and five different, neutral toned colors that are designed to mix and match together if desired. Mannington Adura flooring isn’t sold in any of the big box stores at the time of writing, so to calculate the cost of buying Adura Max flooring you should contact your local flooring stores for current prices. Easier still is to visit the online retailer Wayfair.com. They have a good range of Mannington Adura plank and tile at prices between $3.50 and $4.20. We’ve not come across a cheaper price. Do you have any Mannington Adura or Adura Max flooring reviews to share? If so please contact us or add a comment below. I only planned to do one 200 sq ft room. Do you know if there a order size minimums that would prevent me from doing just one room? Thanks for the details. I was wanting to understand the distinction between the max plank and prime. Your article was helpful!